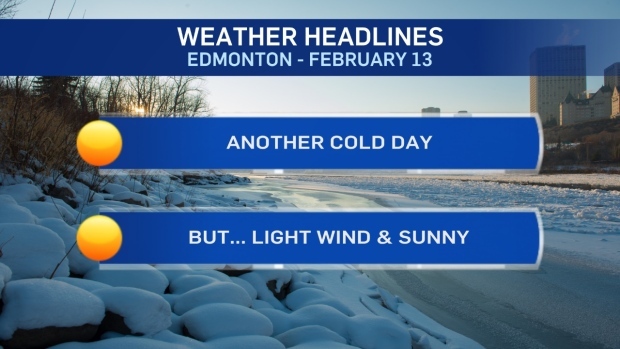 Another day stuck in the Deep Freeze in Edmonton. 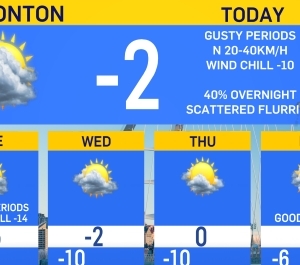 Sun, light wind (thankfully) and afternoon temperatures in the -18 to -20 range around the Edmonton area. Similar weather Thursday (maybe a bit of a breeze). Then...some clouds and a chance of late-afternoon or evening flurries on Friday. No significant snow accumulation is expected. Temperatures will be in the -15 to -20 range for daytime highs Sat/Sun as the cold snap stretches into another weekend. We're still looking at the early to middle of next week as our first forecast high ABOVE -15. I'm going with -14 Tue and -10 Wed. Looking even FURTHER ahead - there's a chance we might not get above -5 until the last day of February or the first few days of March. Today - Mainly sunny. Light wind. Evening - Clear. Light wind. Friday - Mostly cloudy. 40% chance of late-day flurries. Sunday - Mix of sun & cloud.